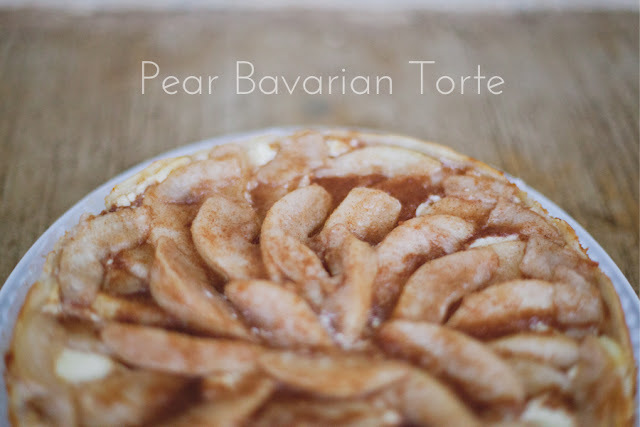 Don't Mind if I Do: Pear Bavarian Torte. Absent doesn't even begin to describe what kind of blogger I have been lately. My apologies. Life, as usual has been, well...hectic, chaotic and just plain busy...and I have been fatigued, passive, and more or less unmotivated. I am hoping that this change in weather will do the trick, but no promises. Here is a repeat recipe. The pear bavarian torte I had made once before and blogged about is no where to be found in the archives, so here it is again. Maybe this time you'll give it a try! ;) I love this recipe, so easy but delicious and somewhat more sophisticated than your average apple tart or pie. enjoy. Heat oven to 425 degrees F. Beat butter and 1/3 cup of the sugar in small bowl with electric mixer on medium speed until light and fluffy. Add flour; mix well. Spread onto bottom and 1 inch up side of lightly greased 9-inch springform pan. Beat cream cheese and 1/3 cup of the remaining sugar in same bowl with electric mixer on medium speed until well blended. Add egg and vanilla; mix well. Spread evenly over crust. Combine remaining 1/3 cup sugar and the cinnamon. Add sugar mixture to pears in a bowl, and toss to coat. Arrange over cream cheese layer, adding as little of the liquid as possible. Bake for 10 min, then reduce temperature to 375 degrees F and continue baking 25 min, or until center is set. Cool on wire rack. Loosen torte from rim of pan. Cover and refrigerate 3 hours before serving. Store any leftovers in refrigerator.